KANSAS CITY, Mo. — The Big 12 Media Day brings out plenty of anticipation and excitement for the upcoming basketball season, and it's no surprise KU is atop the polls — but behind them, at No. 2, is K-State. Why not the Cats? After an Elite 8 appearance, these Cats are hungry to get back to the top. "You're always excited. For us it should be a little more fun. We have a lot of veterans back," said K-State head coach Bruce Weber. 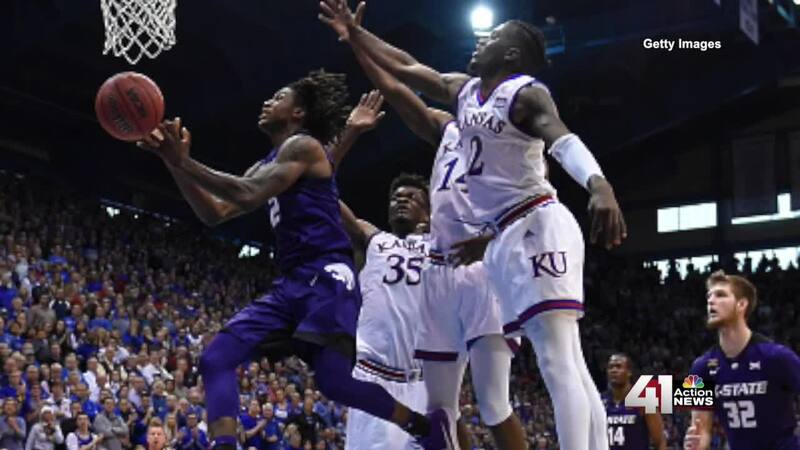 With most of the starters returning, K-State understands what it means for a team to work well on the floor together, having all that experience. "You get real hungry," senior Kamau Stokes said. "You get hungry because you know how close you are, and for us I know we were way better than that. How we performed in our last game. That's been our drive the whole summer and even the offseason." KU has a talented freshmen class coming in and some top-notch talent coming in from Memphis. It could take a couple of weeks to see how the players gel on the floor. Chemistry could be the most important component for this team. "Guys learn each other's tendencies and what each other likes to do," transfer Dedric Lawson said. "You get to see what players can and cannot do, so I think it's pretty good." Kansas also released a statement Wednesday that Silvio De Sousa will not play in Thursday's exhibition game . He's being held out while the investigation continues into a $20,000 alleged payment to his guardian.